Old batteries often spend years sitting in storage collecting dust. Why not clean your home and make some extra money at the same time? By selling old batteries to a salvage yard, you can do just that. Whether you are trying to make a quick buck or just want to clean out your garage, read the tips below to learn how to sell batteries to a recycling location successfully. Used car batteries are bought for their lead cores, which can be used for a variety of other products. Much like everything else, the price of lead fluctuates from time to time. 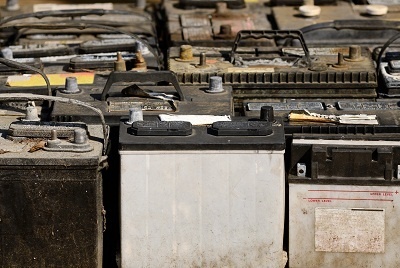 The amount of money you can get from the batteries depends on the current market price of lead scrap. Check online to see the current value at the time when you’re planning to sell. Then, you'll have a great idea how much money you’ll receive for your batteries. Typically, there are about 21 pounds of lead in a battery so, if the scrap rate is $0.33 per pound, you would receive around $7 for each battery. You can simply sell the batteries you already own to a scrap yard. However, if your goal is to make some extra cash, you may want to find some additional batteries to sell to the recycling yard while you’re headed there already. Finding unwanted batteries may be easier than you think. Talk to your friends, post an ad online offering to dispose of old batteries for free, or visit a local mechanic. You may be surprised at how quickly you can collect additional scrap batteries to sell. Once you have your batteries and an estimate of how much money you’ll make, you can begin looking for salvage yards in your area. Easiest way would be to do a web search for recycling yards near you. There will likely be more than one in the area, so get ready to do some comparing. Consider factors like purchase price, convenience, and other specialty services. Some may even offer scrap metal removal services in Montcalm, MI, making things even easier for you. Take your time and choose the right recycling yard. From there, you are ready to sell the batteries and make some easy cash.